We offer opportunities for recreation and tourism in the village of Madara. 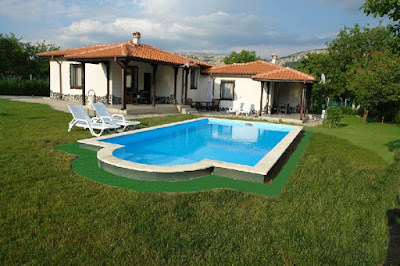 The village is located 40 minutes by car from Varna and 10 minutes from Shumen, 4 km. South of the Varna-Sofia highway. Situated just below the rocks of the National Historical and Archaeological Reserve Madara and the Madara Horseman - chosen as a global symbol of Bulgaria. We offer for rent two detached houses built in the spirit of the old Bulgarian architectural traditions. The houses are one-storey, with 60sq.m. built-up area and 17sq.m. Covered terrace. They are located in a yard of 1400 sq.m. Each house consists of a living room with a kitchen corner (19 sq.m. ), two bedrooms (14 and 10 sq.m. ), a bathroom with a toilet and a covered terrace. The rooms are large, the ceilings are more than 3m high. It is left to see a part of the beams carrying a specific atmosphere. The maximum capacity of each house is: 6 people. Ie. for both houses: 12 people. Extras are: Yard 1400 sq.m., Parking, Satellite TV, DVD, Wireless Internet, Kitchen, Mini bar, Air-conditioner, Pool, Covered terrace. All bedrooms have a view of the rocks. - Historical and archaeological reserve "Madara"
- Architectural monument "Tombul Mosque". - Nature Reserve "Pobiti Kamani"
Rock climbing, cave downhill, paragliding, hunting, fishing, horseback riding.